The Bluetooth kit is supplied with a micro USB lead in the box. If this is not suitable for connecting to your phone please select a different lead from here. Example if you have an iPhone 7/8 then please select the lightning adaptor option. This plugs into the end of the supplied micro USB cable and converts to lightning suitable for your iPhone 7/8. The Bury system 8 was the first car kit to feature interchangeable cradles and boasts a large range of cradles compatible with over 280 mobile phones from all the leading handset manufacturers. 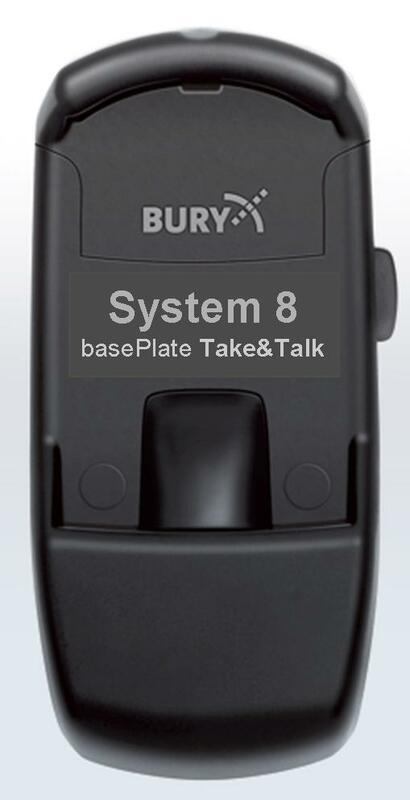 All Bury System 8 Take&Talk cradles power and charge the phone and provide all the features you would expect of a genuine car kit including radio muting and audio Integration (vehicle and installation level permitting). This Take and Talk cradle must be used in conjunction with a Bury System 8 car kit base unit. The Bury universal car kit gives you the convenience to interchange the cradle for your handset simply and easily, at the touch of a button and without the need for an engineer. The system 8 Take&Talk cradles are perfect when you have more than one mobile phone or multiple users of a vehicle while also enabling you to upgrade your handset by simply changing the cradle at the fraction of the cost of installing another hands-free car kit. Note: all Take and Talk cradles must be used in conjunction with a Bury System 8 car kit base unit. Simply unclip your old cradle by pressing the release button on the side of the base plate and then clip your new cradle by sliding up then dropping down as illustrated below in diagram A & B. Now insert the mobile phone in the cradle.